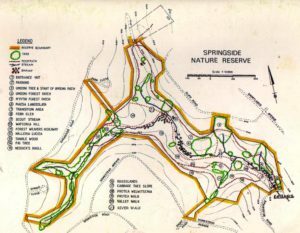 Guided trails are held in the Springside Nature Reserve on a regular basis, for those who would like to walk by themselves or in a group there are many trails to follow. Below is a map that will help you chose your route. The trails are largely on a flat terrain some in shade while others are in direct sunshine and should probably be walked in the early mornings or afternoon. Gate opening times are advertised at the entrance gate and must be adhered to as staff are not on site after these times. The Reserve opens daily from 7am in the morning and closes promptly at 16hoo or 4pm every day of the year.